More bured treasure! This time it is a very large silkscreen by my old friend Alan Larsen. 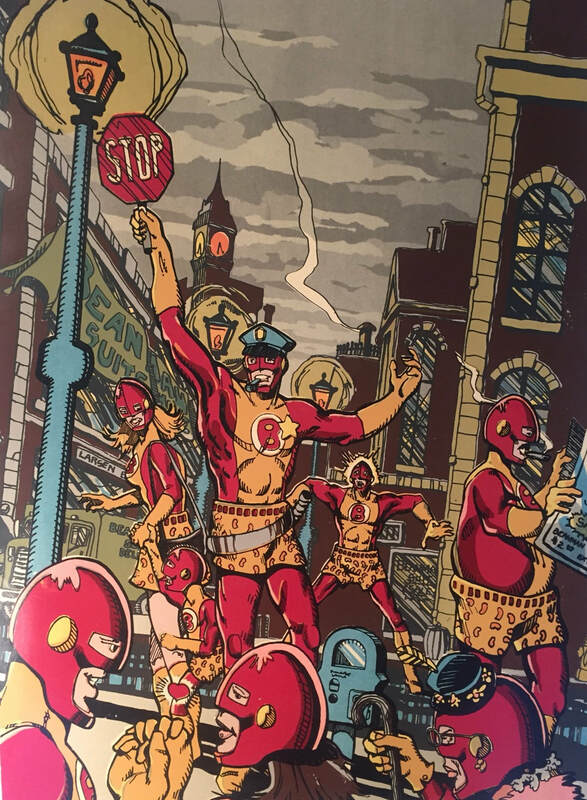 40 years ago Alan did this large multi color silkscreen of Beanman appearing in a city of Beanmen, Miss you Alan. The first Hurri-con in East Rockaway NY. Beanman comics had lots of fun sketching all day. Proceeds were donated to the Bethany Congregational Church in East Rockaway for repairs still being done from the effects of Hurricane Sandy, Thanks to David Donovan for organizing the event. More buried treasure for Beanmancomics.com! Digging through the archeological site known as my attic, I found one of my first silkscreens from the summer of 1979. That summer I did an independent study in silkscreening and produce 4 silkscreens in the course of four weeks. 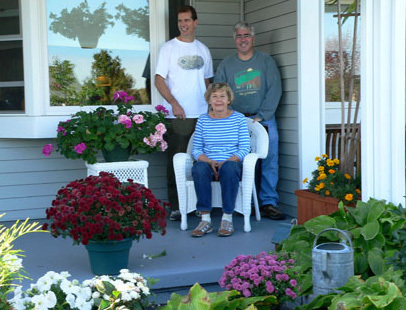 One was this image of "The Beanman Family" as titled. My art professor was not impressed with this one for some reason. 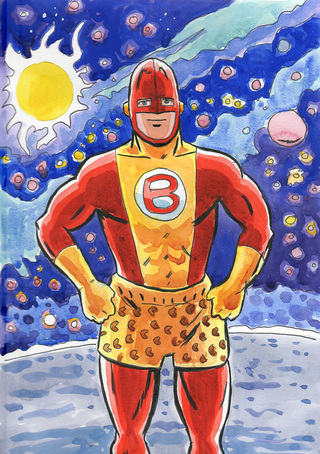 I remember not doing many colored versions of Beanman's costume at the time and mis-coloring parts of the suit in the print. With the magic of modern day digital graphics I have fixed these long troubling mistakes. Enjoy this Beanman time capsule! I found these long forgotten and misplaced negatives going through stuff. The negatives were so small and damaged I am amazed how much the local photo genius was able to save. I believe in Spring 1978 I made arrangements for the SUNY Oneonta Comic Book Club to visit Joe’s studio. Wow, long time ago. I was 19.
second photo: Joe holding the finished cover. I was surprised to find this podcast poking fun at Jim Nastics #1-Gave me some laughs, enjoy! Click the link below. Kimball and Bill spent the day sketching for kids once again. Welcome Beanman Fans to the relaunch of our new Beanman Website. I have tried to make the website more collaborative by switching it to a weekly site. I hope that with the easier software, Kimball and I will post more frequently. Enjoy! For quite some time I have been meaning to write a remembrance of my old friend Alan Larsen. Alan was a gifted artist and accomplished in many mediums. A fun fact is that Alan is also the only person to have ever published a print version of our own Beanman! I first met Alan as an art student at SUNY at Oneonta. Alan was in many of my art classes and a fellow comic book fan. We did not quickly become friends outside of classes; Alan lived at home and commuted to school. Over time we became friends and Alan shared with me his comic book art. Alan was very enthusiastic regarding Kimball’s and my work on Beanman. He never quite got the humor of Beanman wearing boxer shorts with beans on them, however. Alan liked Beanman so much he even illustrated a short Beanman story and a few Beanman silkscreens on his own. I believe this was Alan’s way of showing his admiration for fellow comic artists and a desire to be accepted and join in. Alan was meticulous in everything he crafted. He could quickly master techniques and understood the mechanics and science of everything from pottery glazes to photographic stencils. While I would be trying to figure out how to successfully produce a lithograph, Alan would have already completed four or five effortlessly. After college Alan stayed close to Oneonta working as a potter for Born in the Morning Pottery. A loyal employee he followed them when they moved to New Jersey. Based on his letters, I think Alan was happiest working as a potter, but unfortunately they went out of business in the mid 1980’s. Always a hard worker, Alan continued many comic projects. We collaborated through the mail creating comic stories and posters. 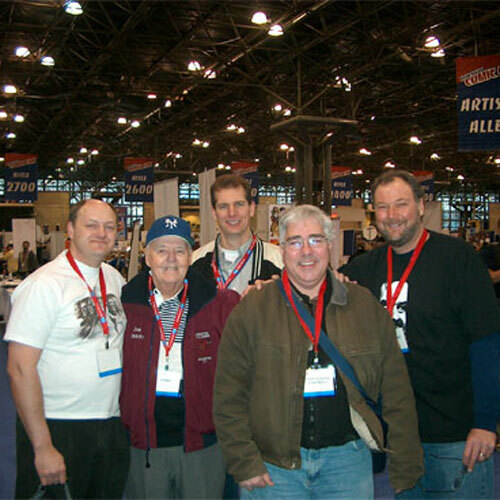 Together we created Jim Nastics in 1983. 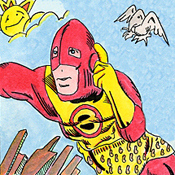 Alan paid for and published two issues of the comic in 1984. 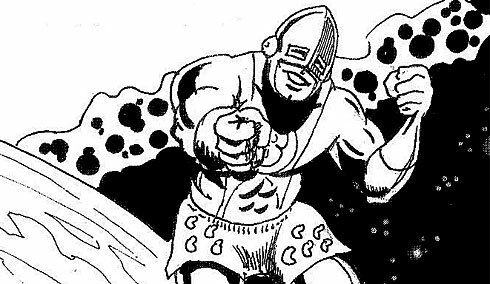 Looking back, Jim Nastics is a very rough and amateurish piece of work, but I will always be proud that it was among the first wave of black and white self-published comics distributed in the mid 1980’s. Later on, Alan published Goon Patrol, asking Kimball and I to do a short Beanman comic as a backup feature. 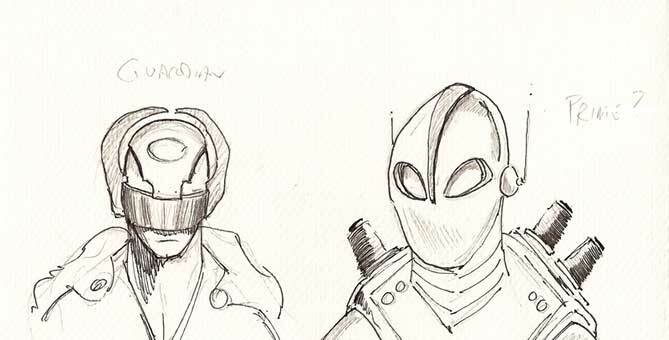 In the mid-eighties with the responsibilities of a new family and less time on my hand, I consciously decided to back away from my dreams to be a comic book artist. Alan, however, never lost his passion for creating comics. He self-published several books in the 1980’s and unfortunately got stung by several small publishers by not being compensated for the work he had done. Many times I wish Alan had some of the time back that he spent hunched over a kitchen table inking work for others without payment. Unknown too many, Alan created all these works while suffering from the debilitating symptoms of Krohn’s disease which ultimately contributed to his death in 1999. Amazingly, Alan’s memory lives on in the comic’s world. I have found a few tributes to Alan on the internet which I have included with links below. Self-publishing weirdly enough leads to immortality in a comic book universe where nothing is discarded. Like so many other artists, Alan lived a short life filled with creating memorable works of art. Today, I sometimes think of Alan while pulling my squeegee or inking a Superman sketch. I wonder if he would approve or give me one of his amusingly disgusted looks. I often remind myself to be wise in creating art with the time I have been given, but Alan was denied. A fantastic image of our hero done by Kimball recently. Kimball posing with a recent Captain America Commission. Kimball and Bill recently attended Free Comic Book Day at JetPack Comics in Rochester, NH. Once again they had a great time drawing sketches and chatting with all that attended. 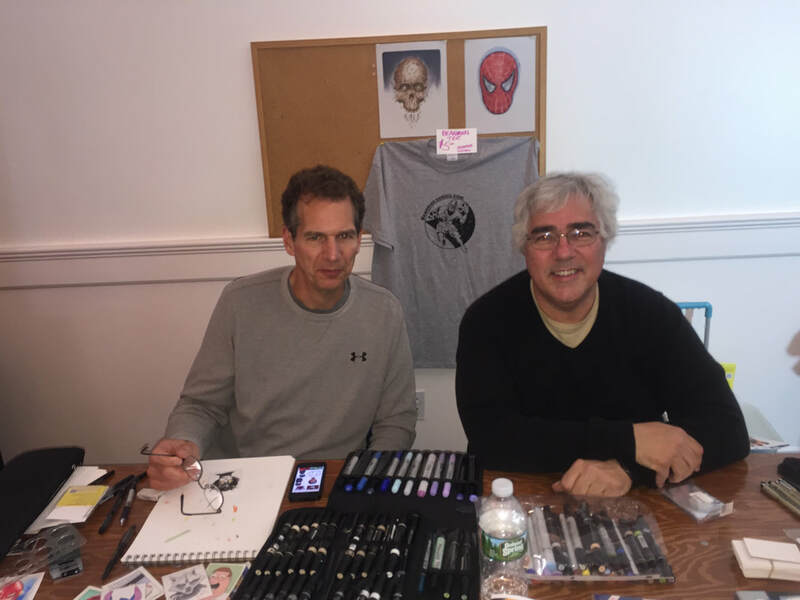 Kimball and Bill recently attended Free Comic Book Day at JetPack Comics in Rochester, NH. They had a great time drawing sketches and chatting with all that attended. Beanmancomics.com CEO's Kimball and Bill were recently spotted at the 2010 NYCC wearing the first new Beanman shirt in 32 years- The shirt is embroided with art by Kimball and available in : "Beanman Suit Red or Yellow", "Planet Bens Blue" ,"Little Creeps White", "Beanman Prime Gold" or "Mayham Black" Act now for quatities are limited! It's been a slow year at Beanman Comics, but needless to say, you can't keep a good bean down. Beanman has had many sabbaticals, but there will always be more Beanman in the future. 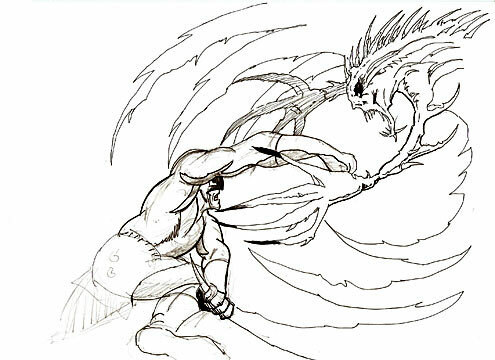 For now, however, enjoy a sketch by my good friend and Kubert School Graduate Dan Pettiglio. 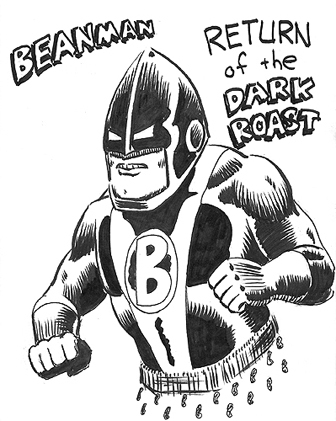 Dan reinterprets how Beanman would look in our grim post-Frank Miller comic world of darker and grittier superheroes. In the early 1990's Dan illustrated issues of Personality Comics that included biographies of Arnold Schwarznegger and Patrick Swayze. Dan's self published "Pro Wrestling's True Facts" illustrated stories from the Golden Years of Professional Wrestling and is still available. Dan was a professional wrestler for many years working under the names Captain USA , Dan Petty and The Spoiler. May 3, 2009 marks the 25th anniversary of Jim Nastics comics. Who is Jim Nastics? How does Beanman Comics fit in to all this? Well here is the story! 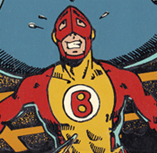 Jim Nastics began as a character Bill created for his comic book friend Alan Larsen to work on. You see, Alan liked Beanman. He liked him a lot! 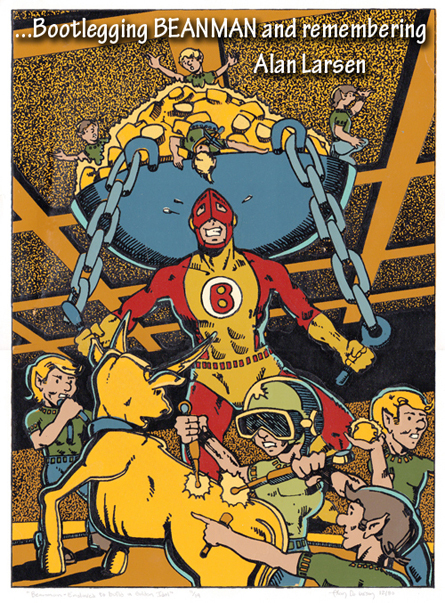 In fact, so much that Bill and Kimball were kind of being driven crazy by Alan drawing his own Beanman stories and creating some fabulous silkscreen prints with Beanman in them. ( The art of Alan Larsen will be featured soon on our website). Bill thought, if only he an Alan had their own character to write and draw stories for. Bill started thinking and he came up with the idea of Jim Nastics. 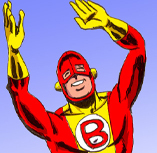 In this way Beanman indirectly brought about the creation of Jim Nastics comics. 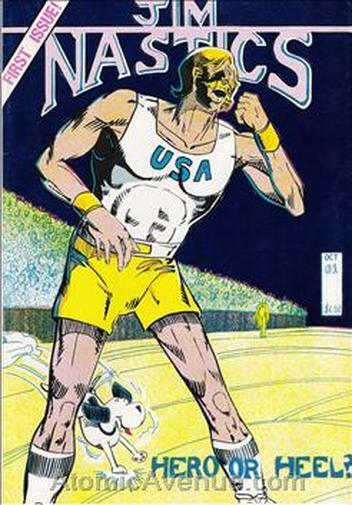 Jim Nastics was an Olympic athlete and involved cold war shenanigans at the 1984 Olympic Games. Jim was kind of an updated version of Captain America, with a secret serum invented by secret government scientists that gave him super bouncing and acrobatic powers. Alan and Bill spent many hours (pre-internet) talking on the phone and preparing the first issue of Jim Nastics Comics. It was to be unveiled at the May 3, 1984 Portsmouth Comic Con. Here is where the story really gets weird. That day, on the other side of the convention floor, another self-published black and white comic book was being unveiled. 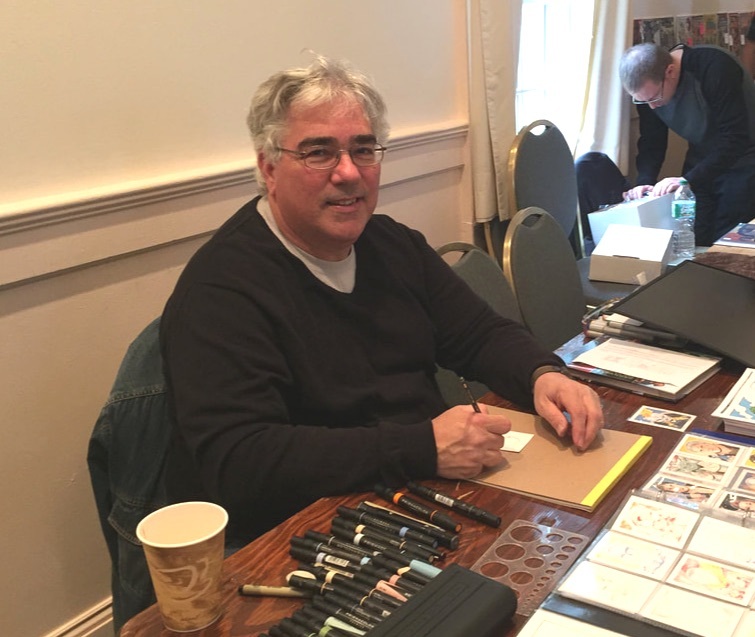 Just a little thing called "Teenage Mutant Ninja Turtles #1" You see Peter Laird and Kevin Eastman, the Turtles creators were also from Dover, New Hampshire and had also picked the small Portsmouth Convention to roll out their newest comic creation. Most of us know what happened to their creation...but what about poor Jim Nastics? Jim Nastics #1 did okay and made Alan a few dollars. Alan fronted most of the money to publish the black and white comic. Jim Nastics #2 came out sometime later and did less well. Jim Nastics #3 was prepared, but never printed. Old copies of Jim Nastics are kicking around on the Internet, trying to be sold by folks here and there. A lesson that no matter how small or bad a publication is, it will probably remain in existence somewhere and that someone will probably be trying to sell it for a buck on eBay. When ever I see a Teenage Mutant Ninja Turtles comic, however, I always think about Jim Nastics and my own personal 'What if things had been different' story. Happy 25th anniversary Jim Nastics! A busy winter has resulted in some much needed updates for Beanman Comics! Kimball and Bill attended the NY Comic Con in early February. They were able to hang out with Joe and Mark Sinnott and enjoyed watching Joe being interviewed for an upcoming documentary on great comic creators. Meanwhile on the website, the last episode of the Envi-ron story appeared recently. Hopefully another Mitchell-Thorpe effort will follow soon! 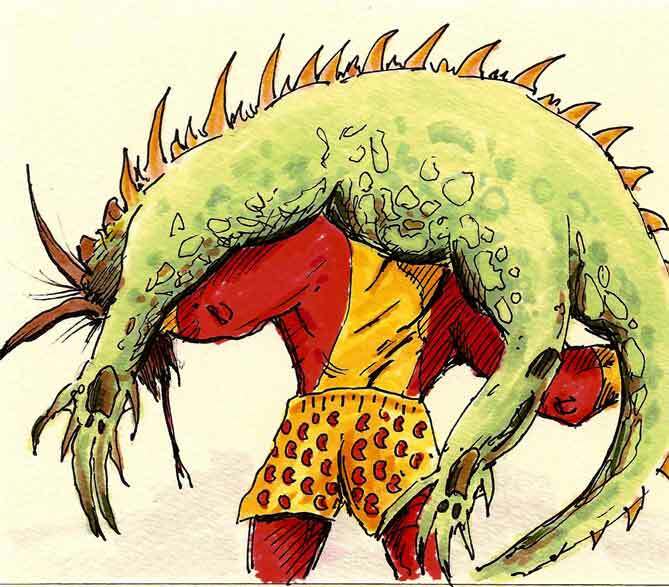 Finally, Dave Wiley, a talented young writer has submitted a new plot to Beanman comics. The story fits into Beanman's timeline during Brian's high school years. This is our first fan contribution to Beanman Comics.The story appears here in text format for everyone to enjoy! Beanman creators to descend on Big Apple. Kimball and Bill are planning their annual visit to the NY Comic Con once again to catch up with they old pals Joe and Mark Sinnott. The event has hundreds of artists and tons of art to admire. Meanwhile at Beanman Comics the "Envi-ron story" nears completion. Plan on seeing some monstorous happenings in the near future for Beanman. Beanman Meets Environ! A new Beanman story by Thorpe and Mitchell for 2009! 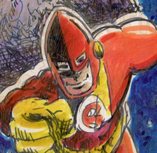 Kimball and Bill have been working hard on a new Beanman story for the Beanman Comics web site. Bill penciled this 6 episode story (the first complete comic by Bill since 1987)and Kimball has finished inking this story! Many years have gone by since Kimball has inked Bill's pencil's and you will not be disappointed! As Bill and Kimball met in NH for the Beanman summit '08 this summer Bill showed off his original Beanman tee shirt. Unable to squeeze into this yellow and red work of art there was someone around who could wear this piece of history. Jen Thorpe was the envy of all as she sported the last remaining Beanman shirt from the late 70's. Beanman shirts are rare so it was a treat to see this shirt from the distant past. Funny how all the shirts back then were so small. Beanman comics stormed the New York Comic Con this weekend. Kimball and Bill enjoyed spending time with many talented comic artists and viewing their amazing artwork. They were especially grateful to visit with their old friends Joe and Mark Sinnott. In other news the origin of Beanman Prime continues with episodes 12 and 13! from the folks at Beanman Comics! Beanman drops in on the Sinnott's of Saugerties! Nuff Said! Kimball and Bill were lucky to spend an afternoon recently with their old friends Comic Legend Joe Sinnott and his son Mark. The afternoon went by too quickly looking at Joe's recent work and catching up. Mark brought out an old photo album and we all reminisced about comic shows of the past. We all agreed that we hadn't changed a bit. Let's hope we can all get together again and hopefully we don't wait too long to do it! Things have been a little slow here at Beanman Comics, but have patience everyone. Beanman took a rest for 30 years, but this being the year of the bean, more fun is just around the corner. Kimball has been plotting and planning to explore the origins of Beanman Prime and promises Episode 10 is just around the corner. Kimball presents a variant pencil version of the Episode 10 installment. Beanman Summit 2007 Invades New Hampshire Lakes Region! Beanman creator's Kimball Thorpe, Bill Mitchell and their talented editorial staff met for a elegant business luncheon recently in the beautiful White Mountains of New Hamsphire. The rainy day was spent enjoying some tasty turkey and discussing future plans for Beanman Comics. Honorary BeanMother, the ever radiant Miss Moneypenny, provided her much needed editorial assistance. More proof that Beanman returns in 2007! Hello again Bean-friends! 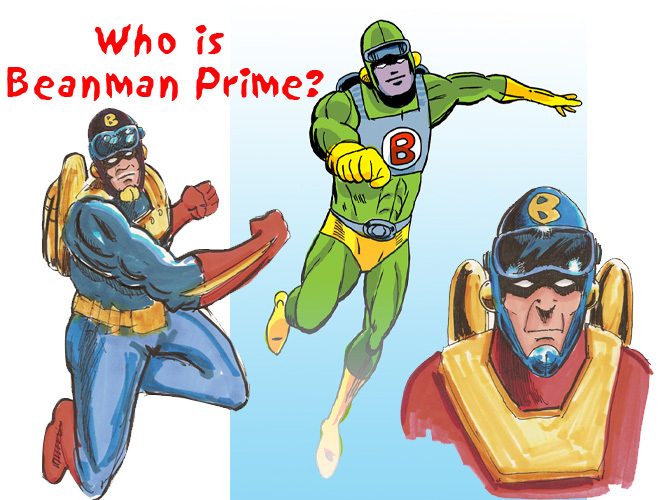 We are currently developing the character of Beanman Prime. He was never more than a space suit in the beginning so he really needs fleshing-out. Bill and I have gone back and forth on this and the sketches shown here reflect our intention of making him "old school". The story line around Prime and how he created the Beanman suit should be interesting, especially if we can explain those shorts away. This is just more evidence that Beanman iz. A busy week at Beanman Comics! Kimball finished episode 7 of his "Legion" story and Bill made Organic Tales #2 available for on-line viewing for the first time. More fun to come at Beanman Comics. Enjoy Kimball's sketch of the week below! Hi Beanman Friends. KImball sent me this awesome drawing from a greeting card of our hero carrying a heafty load.Kimball had been doing homemade greeting cards for years using the trademark "Yet Another Thorpe card" This was a drawing for a birthday card, the inside greeting reads "I caught it,, You clean it" I'm hoping Kimball will share these gems with us from time-to-time here on Beanman Comics.com. Kimball completed Episode 5 of our current storyline this week. A black and white version is currently posted with a color version to come! Beanman Comics has been up and running for two months now! 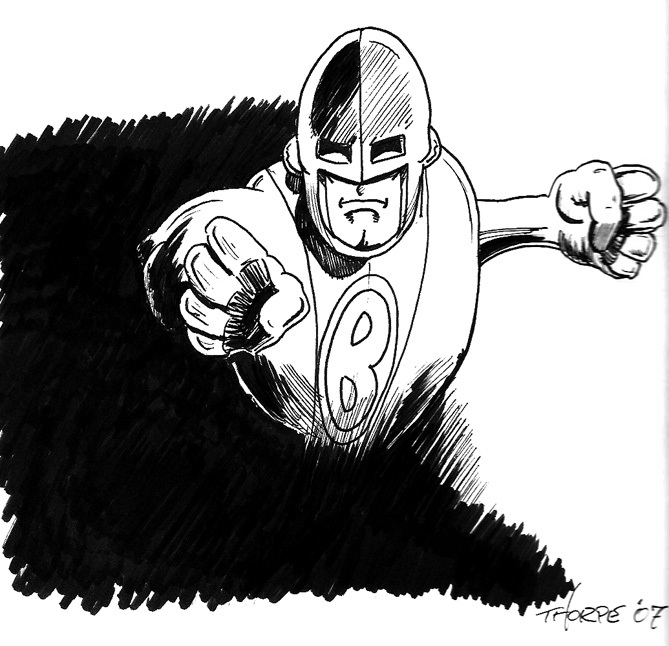 Kimball has been hard at work on the first new Beanman story in over 20 years. Bill has been helping out behind the scenes, putting togther the website and adding color to Kimball's new episodes. Kimball and Bill have been kicking around ideas for future stories and characters to be featured in Beanman Comics. See a preview with Kimball's character designs below. 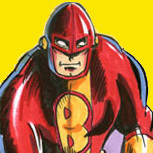 Later this month the second classic Beanman comics from 1976 will make it's debute on Beanman Comics.com. Wow! Finally, our old friend, Marvel Comics Legend Joe Sinnott has a new biography available from TwoMorrows Publishing! Brush Strokes With Greatness: The Life and Art of Joe Sinnott is a 136 page trade paperback book available from The book ships 5/23/07. Kimball and Bill were lucky to be invited to Joe's Saugerties studio many times while growing up in Catskill, New York. We won't forget the good times we had on our visits. Joe' son Mark Sinnott does a great job every month producing Joe's Web-site , www.joesinnott.com a treasure trove for Joe Sinnott fans! Thanks Mark and keep up the good work!